If you have not had your picture taken yet for the Church Directory please do it Sunday. Picture Make-Up Day, Sunday April 30th, following worship service in Building 400 Suite C.
This Sunday I’m finishing my sermon series on “Be Like Christ” with a sermon entitled, “Look Forward to Becoming Like Christ,” from Philippians 3:7-21. When we give our lives to Jesus his Spirit comes into our hearts in order to mold us into his image. We then need to learn to depend on him instead of ourselves. He’ll use our minds, bodies, backgrounds and surroundings but we’ll have faith that it’s him working through us. We let God chisel away any part of us that doesn’t look like Christ. This Sunday we’ll look at how Jesus will finish that task of making us like him when he comes again. He’ll give us new bodies for a new heaven and earth, bodies that will not be tempted to sin. John wrote, “We know that when he appears we will be like him, because we will see him just as he is” (1 John 3:2). What a day of rejoicing that will be! But we might as well start rejoicing right now, because God’s word is true and utterly reliable. We’ll learn how to celebrate becoming like Christ this Sunday. After church we’ll have a potluck, so bring plenty of food so we can share with those who might forget to bring something. Also, invite friends and family. Please drop your food off in our newly painted fellowship hall before Sunday School and participate in our awesome Bible Studies at 9:00. If you haven’t gotten your picture taken for our directory, please get one taken this Sunday during the potluck. Those directories help us know who’s who, and they help us celebrate our church family – the very body of Christ. Also, we need you to bring as many people as possible to our “Walking in the Light” prayer seminar with Jerry McCullah this Friday night at 6:00. We’ll eat and learn together. Then the next morning at 9:00 we’ll prayer walk together, or prayer drive, or prayer sit in front of a computer as we lift up needs from around the world. This too will help us become like Christ who, as a man, spent countless hours in prayers to the Father. 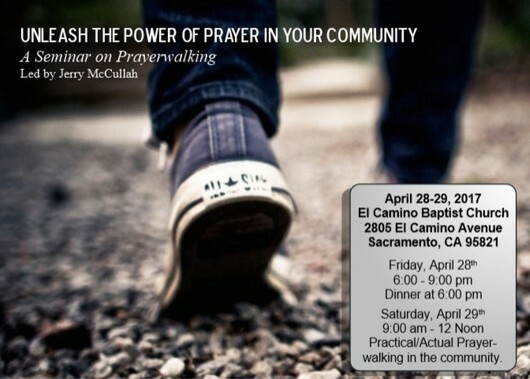 A practical seminar including prayerwalking in the community. The Fellowship Hall Renovation is done! Join us this Sunday for the experience of fellowship like the early church did in Acts 2:46 as they shared and ate together!